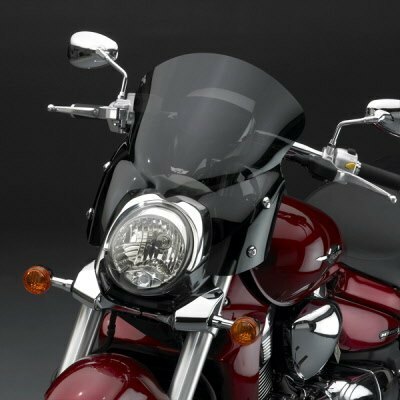 M1800R2 Windshield Sports dark tint V Stream M109R2 Windshield VZ1800R windscreen sports dark tint screen .N28204 SUZUKI M1800R2 WINDSHIELD DARK TINT SPORT revolutionises windscreen performance with the new VStream M109R2 windscreen advanced 'V' shape and dimensional contours push the wind vortex out and away from the riders' helmet, resulting in a peaceful, quiet environment. Greatly reduced wind noise... much less turbulence... The VStream revolution is here! Provides excellent wind protection for taller riders or for long touring distances. The aggressive, stylish profile complements the lines of the M109R2. The tint lets the bike's front end details show through. Sturdy 4-point mount system attaches to the forks, requires no modifications to stock components, and provides outstanding rigidity. All hardware is included. Beautifully powder coated fork mount clamps ensure no high speed handling problems whilst allowing a greatly improved touring speed than before ! Thick FMR hardcoated Lexan® polycarbonate gives this VStream excellent optical clarity and strength. It has 10X more abrasion resistance than acrylic materials, and 23X better crack and impact resistance. This is a tough, long lasting windshield material that you'll appreciate for many years. DOT Approved. Lexan polycarbonate not usual cheap weak perspex/acrylic!! these screens are bulletproof- see our video for proof!